​WHEN AN OPPONENT COMES FORWARD, MOVE IN AND GREET HIM; IF HE WANTS TO PULL BACK, SEND HIM ON HIS WAY. 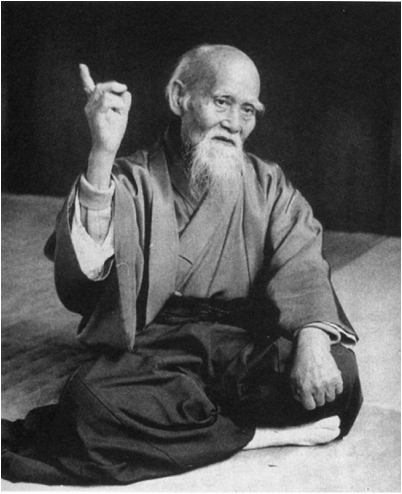 Platte City Aikikai is a dojo located in Platte City, Missouri that focuses on a martial art known as Aikido. Aikido is a Japenese martial art developed by Morihei Ueshiba(O-Sensei) and is rooted in the Japanese Samurai warrior traditions along with Ueshiba’s study of Daito-Ryu jujitsu. Aikido replaces the maiming and destruction of classic jujitsu with control and compassion through blending with the motion of an attacker and redirecting the force of the attack rather than opposing it directly, which is great for younger students learning their first martial art. This results in very little need for physical strength, as the Aikidoka "leads" the attacker's momentum using entering and turning movements. This is great for all ages and abilities as students focus on balance and control instead of the reliance of strength. The techniques are completed with various projection or immobilization arts to diffuse the situation rather than destroy the opponent. “To injure an opponent is to injure yourself. To control aggression without inflicting injury is the Art of Peace." The Platte County Community Centers, operated by the YMCA of Greater Kansas City is located just a short distance south of exit 18 from I-29 N/US-71 N or I-29 S/US-71 S.